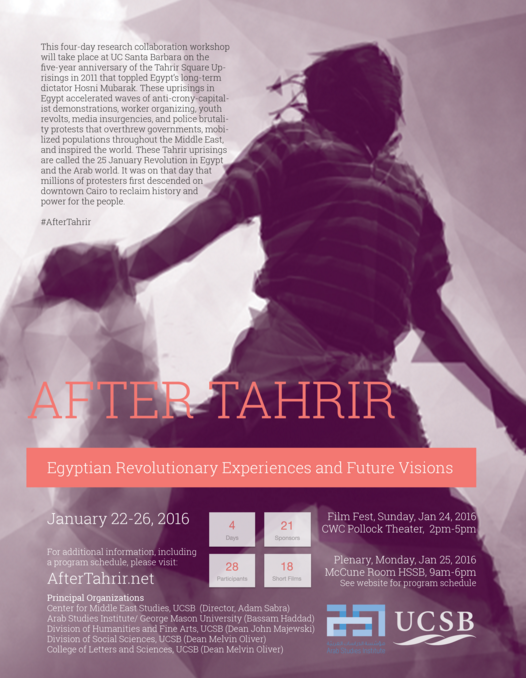 This four-day international symposium at UC Santa Barbara will take place on the five-year anniversary of the Tahrir Square Uprisings in 2011 that toppled Egypt’s long-term dictator Hosni Mubarak. These uprisings in Egypt accelerated waves of anti-crony-capitalist demonstrations, worker organizing, youth revolts, media insurgencies, and police brutality protests that overthrew governments, mobilized populations throughout the Middle East, and inspired the world. These Tahrir uprisings are called the 25 January Revolution in Egypt and the Arab world. It was on that day that millions of protesters first descended on downtown Cairo to reclaim history and power for the people. This conference is part of the Egypt Project initiative of the Arab Studies Institute. Future iterations will build on its findings. Adel Iskandar is an Assistant Professor of Global Communication University in Vancouver, Canada. He is the author, coauthor, and editor of several works including Egypt In Flux: Essays on an Unfinished Revolution (AUCP/OUP), Al-Jazeera: The Story of the Network that is Rattling Governments and Redefining Modern Journalism (Basic Books), Edward Said: A Legacy of Emancipation and Representation (University of California Press), and Mediating the ArabUprisings (Tadween Publishing). Iskandar’s work deals with media, identity and politics and has lectured extensively on these topics at universities worldwide. His most recent publication is the coedited volume Media Evolution on the Eve of the Arab Spring (Palgrave Macmillan). Iskandar taught for several years at the Center for Contemporary Arab Studies and the Communication, Culture, and Technology program at Georgetown University. He is a co-editor of Jadaliyya and an associate producer of the online audio journal Status. Ahmad Shokr is a doctoral candidate in NYU’s Joint Program in History and Middle Eastern and Islamic Studies. His areas of research include the history of the modern Middle East, global political economy, empire and decolonization, the history of capitalism, and critical development studies. Shokr holds a BA in History from the University of Toronto and an MA in Near Eastern Studies from NYU. He is a former senior editor at Egypt Independent as well as a book review editor for Arab Studies Journal. He has been active in several social and economic justice initiatives, including the Campaign to Drop Egypt’s Debt. His writings on historical and contemporary political issues have appeared in Arab Studies Journal, Middle East Report, Jadaliyya, and Economic and Political Weekly. He is also a contributor to several volumes, including Dispatches from the Arab Spring: Understanding the New Middle East and The Journey to Tahrir: Revolution, Protest, and Social Change in Egypt. Ahmed Awadalla is an activist, writer and organizer who has engaged in issues of health, sexuality, gender and (forced) migration. His blog ‘Rebel With A Cause’ was one of the leading online spaces to address these issues in Egypt. His political work around these themes ranged from grassroots organizing to advocacy at the United Nations around sexual and reproductive health and rights. He is currently based in Berlin and continues his work on these themes in Germany. Director of the Civil Liberties Unit at the Egyptian Initiative for Personal Rights and an adjunct lecturer in Law at the American University in Cairo. His research cover a broad spectrum of issues including the politics of religion in the public sphere and the complexities of judicial reform in Egypt and the Arab Middle East. Amr is also member of the AUC Law and Society Research Unit. Anjali Kamat is an award-winning journalist with Fault Lines, Al Jazeera’s current affairs documentary program. She was formerly a producer/correspondent for Democracy Now and has reported from the Middle East, South Asia and the United States for over a decade. She spent 2011 covering the Arab uprisings from Egypt and Libya. She has an MA in Near Eastern Studies from New York University, a post-graduate diploma from the Asian College of Journalism in Chennai, and is on the Editorial Committee of MERIP. She’s currently working on a book about migrant workers in the Middle East. 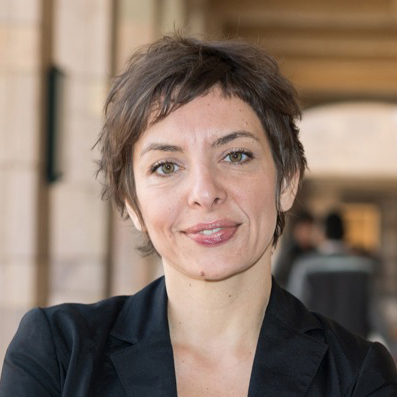 Aslı Bâli is Professor of Law at the UCLA School of Law and Director of the UCLA Center for Near Eastern Studies. She teaches international and comparative law and her research interests span from international human rights law to the comparative law of the Middle East. She is the author of numerous articles including, “Troubling the Turkish ‘Model’ after the Uprisings” (forthcoming 2016), “Negotiating Non-Proliferation” (2014), and “Pax Arabica: Provisional Sovereignty and Intervention in the Arab Uprisings” (2012). She currently serves as chair of the Advisory Committee for the Middle East and North Africa Division of Human Rights Watch. Dalia Abd El-Hameed is the Gender and Women’s Rights officer at the Egyptian Initiative for Personal Rights (EIPR). Her mandate at EIPR includes national and international advocacy for sexual and reproductive health and rights, documentation of sexism in the public space and other issues related to Gender Based Violence and gender-mainstreaming within EIPR programs. She holds a masters degree in sociology and anthropology from the American University in Cairo, she wrote her thesis on the organized football fandom in Egypt (The Ultras). Heba Y. Amin is an Egyptian visual artist, researcher and, currently, visiting assistant professor at the American University in Cairo. She received her MFA at the University of Minnesota and is a DAAD grant recipient, a Rhizome Commissions grant winner and a recent short-listed artist for the Artraker prize. She is currently Curator of Visual Art for Mizna’s journal, curator for the biennial residency program with Ramdom Association and co-founder of the Black Athena Collective. Working in various media, Amin addresses themes related to urbanism and technology. She also has an extensive repertoire in public speaking. Amin lives between Berlin and Cairo. Hesham Sallam is a Research Associate at Stanford University’s Center on Democracy, Development, and the Rule of Law and serves as the Associate-Director of the Center’s Program on Arab Reform and Democracy. He is also a co-editor of Jadaliyya ezine. His research focuses on Islamist movements and the politics of economic reform in the Arab World. Sallam received a Ph.D. in Government (2015) and an M.A. in Arab Studies (2006) from Georgetown University. Jessica Winegar is the Harold H. and Virginia Anderson Chair and Associate Professor of Anthropology at Northwestern. She is the author of numerous articles on arts and culture in/of the Middle East, with a number of recent writings on Egypt’s uprising. Winegar’s book Creative Reckonings: The Politics of Art and Culture in Contemporary Egypt (Stanford, 2006), won the Albert Hourani award for best book in Middle East studies and the Arnold Rubin award for best book on African arts. She is also a co-author, with Lara Deeb, of Anthropology’s Politics: Discipline and Region through the Lens of the Middle East (Stanford, 2015). She was also the Virtual Gallery curator for ArteEast for five years. Joel Beinin is the Donald J. McLachlan Professor of History and Professor of Middle East History at Stanford University. He received his Ph.D. from the University of Michigan in 1982, his M.A. from Harvard in 1974, and his B.A. from Princeton in 1970. From 2006 to 2008 he served as Director of Middle East Studies and Professor of History at the American University in Cairo. In 2002 he served as president of the Middle East Studies Association of North America. Beinin’s research and writing focus on the social and cultural history and political economy of the modern Middle East and North Africa, primarily Egypt, Israel/Palestine, and Tunisia. He has written or edited eleven books. The latest is Workers and Thieves: Labor Movements and Popular Uprisings in Tunisia and Egypt (Stanford University Press, 2015). Lina Attalah is co-founder and chief editor of Mada Masr, a Cairo-based news website. She worked in journalism for the last 15 years, reporting on Egypt for a number of local outlets such as the Cairo Times and the Daily Star, as well as the region such as the current war in Syria, the Darfur conflict and the Iranian presidential elections for the BBC, the Guardian and the BBC. She also worked on several research projects with academic and cultural institutions surrounding issues of technology, intellectual history, space and the sea. Magda Boutros is a PhD student in sociology at Northwestern University. She studies security and penal systems and social movements. Prior to her PhD, Magda worked in human rights research and advocacy in Cairo and specialized in issues of policing and human rights, prison conditions and sexual violence. She has an undergraduate degree in English and French Law (Sorbonne and King’s College London) a masters degree in Criminology (King’s College London). I graduated from Political Science Department in Cairo University in 2005 and finished my MA in Arab Studies from Georgetown University in 2011. My M.A thesis (defended in 2013) discussed the controversial history and memory of Adham al-Sharqawi, one of the most well know bandits in Modern Egypt who was assassinated by the police in 1921 and whose life resembled the question of criminality after WWI and the 1919 anti-colonial revolt in Egypt. The perplexing conflation between criminality, heroism and anti-colonial struggle in a liquid revolutionary moment was influential to address, in a similar vein, the discussions on revolution, violence and history in 2011. The relationship between the two moments (1919 and 2011) propelled other theoretical questions on the relationship between past and present and the narration of history and temporality; in other word how they refract each other and how do such questions reconfigure our understanding of history and memory not simply as an archival depository or as a useable site for present manipulation, but as part and parcel of any revolutionary thinking to intervene and to blast the continuum of the “now time” and to rethink the relationship between past, present and future. Momen El-Husseiny is an Assistant Professor of Architecture and Urbanism at Cairo University. He is a licensed architect and a trained ethnographer with a Ph.D. from the University of California, Berkeley. His dissertation “Compounds of Modernity: National Order and the ‘Other’ in Egypt (1940-present)” was completed in August 2015. He lectured at UC Berkeley, Academy of Arts in San Francisco, and the American University in Cairo. His ongoing book project, Building ‘New Compounds’: A History of Housing and Development in Contemporary Egypt (1940-2011), falls within the domains of biopolitics and control, hygiene and growth, postcoloniality and neoliberalism. Ms. Mozn Hassan is the founder and Executive Director of Nazra for Feminist Studies ( www.nazra.org) since December 2007. Her research interests range from combating violence against women, to history of feminism in Egypt, to early child marriage. She has an MA from the American University in Cairo with a thesis on “Legal Interpretations to the Right to Divorce and Polygamy and the Egyptian Feminist Movement.” Ms. Hassan served as Egypt advisor with the Global Fund for Women and from May 2015 as Board member to Global Fund for Women. She served as consultant to different projects on “Combating Female Genital Mutilation”, “Gender Mainstreaming “and “Women Political Participation.” Ms. Hassan received the inaugural Charlotte Bunch Human Rights Defender Award on April 17th, 2013 at the Global Fund for Women’s 25th Anniversary Gala. She currently is a consultant for Women Human Rights Defenders MENA Coalition, a member in the International Planning Committee for AWID Forum 2016, and Global Fund for Women Board member . Omnia Khalil, is a PhD student in anthropology program in the Graduate Center in City University of New York (CUNY). She is an urban researcher and co-founder of 10 Tooba| Applied Research on the Built Environment, an urban collective that combines research withurban action, i.e. involvement in the struggles of marginal urban communities. She finished her MA thesis in American University in Cairo in anthropology. Her thesis titled “The People of the City. Space, Laboring and Power”. Her BSc thesis at Cairo University’s Architecture Department took place in the Tanneries Quarter of Old Cairo, and was featured at the 2006 Venice Architecture Biennale as well as receiving an award from the WA World Architecture Community. Ranwa Yehia worked as a journalist, writer and researcher in the Arab region for fifteen years before moving on to focus on Arab youth empowerment. In 2005, Yehia shifted careers to interrogate, explore, research and develop alternative education methodologies for Arab youth. In doing so, she engaged with Arab activists from diverse disciplines who collaborated to create a program for Arab Digital Expression Camps. Yehia is a social entrepreneur and the founder of the Arab Digital Expression Foundation (ADEF) who was awarded the Ashoka Arab World Social Entrepreneur fellowship in 2008. The focus of her work revolves around mobilizing diverse networks to create and develop open knowledge production in Arabic. At ADEF, Yehia’s focus continues to be the camps and how the methodology and knowledge developed in the camps process is transferred to collaborations among communities on the ground in Egypt and other Arab countries. Yehia is a single mother of two and parent of three boys. Her role as a parent has also gotten her involved in autism-related issues and she is active within the community on autism awareness. Sarah Rifky is a writer and curator. She is co-founder of Beirut, an art institution in Cairo (2012- 2015). Rifky was co-curator of the Jogjakarta Biennale XII (2013), curator of Townhouse (2009-2011) and curator for dOCUMENTA(13) (2012). She co-managed MASS Alexandria (2010-2012) and was taught Art History and Theory at the American University in Cairo (2010). She is the co-editor of Positionen: Zeitgenössische Künstler aus der Arabischen Welt (2013) She is the author of The Going Insurrection (2012), in addition to numerous essays and stories. Rifky is a doctoralstudent at the History, Theory and Criticism program and the Aga Khan Program for Islamic Architecture at the Massachusetts Institute of Technology. Wael Eskandar is an independent journalist and political analyst based in Cairo. He is a frequent commentator on Egyptian politics and has written for Ahram Online, The Independent, Daily News Egypt, Counterpunch, and Jadaliyya, among others. He has also contributed to several campaigns including Egypt’s Kazeboon which highlighted crimes and lies committed by the Egyptian regime by compiling and screening footage in streets. Eskandar has made media appearances for Al Jazeera, Russia Today,France 24 and Alhurra. He blogs at notesfromtheunderground.net. 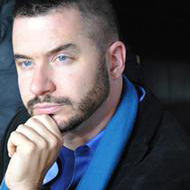 Yahia Saleh, an activist who has been engaged in issues concerning ethnic minorities, queer issues and political participation. Together with other Nubian youth activist brought up the Nubian issues to the political sphere after decades of marginalization, advocated for cultural recognition and land rights. With challenges of combining colour, ethnicity and sexuality and brought the different identities to different contexts advocated for different issues within different contexts. Currently based in Malmö, Sweden. Obtaining master’s degree at Malmö University in international migration and ethnic relations. 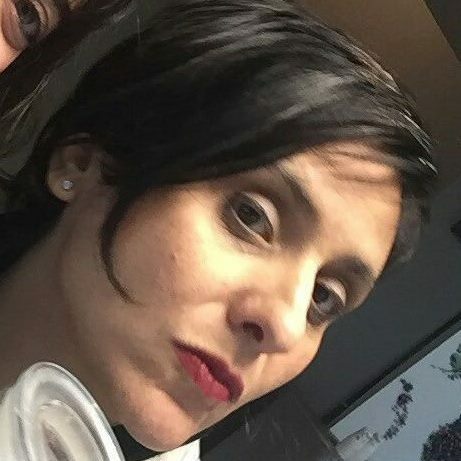 Yasmin El-Rifae is a writer, researcher, and cultural producer. She is currently a Middle East research associate at the Committee to Protect Journalists in New York. She is researching a book about Operation Anti-Sexual Harassment and Assault, in which she was an active organizer in 2012 and 2013. Yasmin is co-producer of the Palestine Festival of Literature. Prof. Amar is a specialist on human rights, gender/sexuality politics, urban civic/public space, public cultures, authoritarian states, and institutional cultures of mili­tary, police and security. An award-winning author, he has published three books or volumes on Egypt and lived in Cairo for eight years. In the past he has worked for many years as a journalist and as for five years as a human-rights defender at the United Nations in projects on El Salvador, Colombia, Brazil, and Palestine/Israel. Prof. Seikaly is a specialist in social history of resistance and colonialism in the Middle East, focusing on class formations, nationalism and gender, cultural and economic history, archive research methods, political journalism and new media production, and material history of the body, food, and consumption in relation to both control and revolt. She was Assistant Professor of History at the American University in Cairo and served as Director of the Center for Middle East Studies during the 2011 revolution. She lived in Cairo for five years. Prof. Sakr is a digital media theorist, artist, and activist working in social media, digital archives, computer analytics, data visualization, glitch art, live cinema, video installation, and Middle East film and new media. She is Assistant Professor of Film and Media Studies at UC Santa Barbara. Her work uses digital logic and technique to map how participation in virtual worlds and networked publics has influenced the formation of a virtual body politic. This research led her to design the R-Shief media system for archiving and analyzing content from social networking sites, and the cyborg representation of VJ Um Amel. Originating from Alexandria, and living in Cairo intermittently throughout her life, Prof. Sakr has been a leading voice in the open source movement in Egypt and the Arab world. Shereen Sakr has shown in solo and group exhibitions and performances at galleries and museums across the Americas, Europe, and the Middle East, and has published extensively.